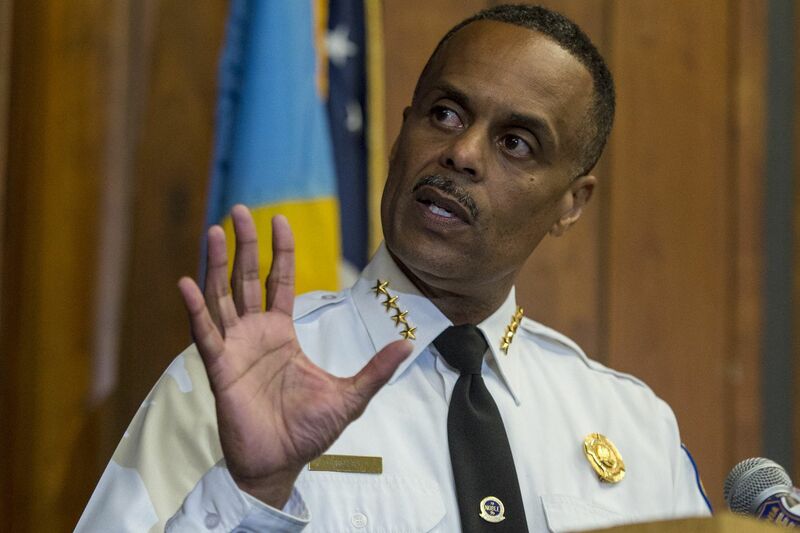 Philadelphia Police Commissioner Richard Ross has a new policy covering defiant trespass. Philadelphia Police Commissioner Richard Ross has ordered an increased police presence outside newsrooms throughout the city in the wake of Thursday's fatal shooting attack at the Capital and Maryland Gazette newsroom in Annapolis, Md. Ross spoke to journalists and other staff at the Inquirer and Daily News on Friday morning about safety measures and plans to do the same at other local media offices. "You folks should have our assurances that we take this very seriously," he said. On Thursday, a gunman who had lost a defamation lawsuit against the Capital opened fire in its newsroom, killing five employees of the newspaper. Police said the shooting was a targeted attack. Ross said the Police Department's homeland security and patrol officers would be posted outside Philadelphia newsrooms looking for anything that seems out of place, such as someone standing across the street for too long. Officers also will check in with security guards in each lobby. "Unfortunately … you're often dealing with people with mental instability," he said. "Some of those folks really will choose these opportunities, because sometimes people are speaking to them in their mind's eye and this is what they have to do." The heavy police presence near newsrooms is meant to deter copycats, Ross said, and to let them know that "this is not a safe space to do this." He asked that journalists report any threat or persistent comments from a particular person that seem to go too far. "If the hairs on your neck stand up for some reason, don't ignore it," Ross said. "You can't be dismissive about it in this day and age, because you just never know. I don't say that to alarm people. It's just to say you have to be aware. We live in a different world." He said several times that it's part of police work to investigate threats, and he encouraged people to come forward with information. "Please, please, I implore you, make a little file," the commissioner said. "If it seems like you get one more crazy note, tweet, or whatever, let us have it, let us vet it, let us decide whether it's someone that we need to touch."